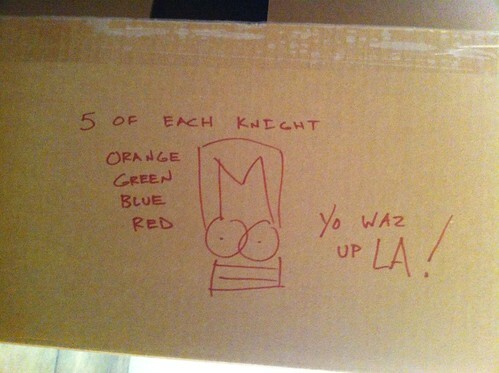 On Saturday, July 13 gem and I headed to Los Angeles for Game Night featuring The Behemoth at Giant Robot 2. 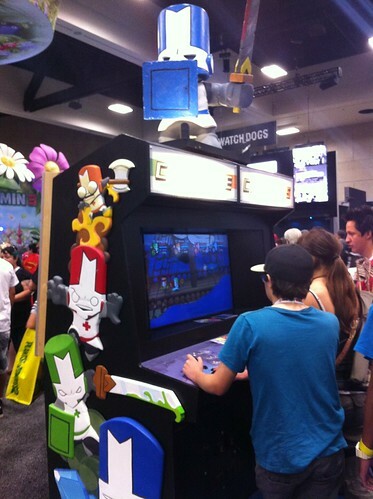 The location was filled with The Behemoth merchandise as well as game stations with Alien Hominid HD, Castle Crashers, and BattleBlock Theater. Most of the merchandise consisted of things we’d seen, but there were a few new things, including a Cat Guard bank. It was cute but not cute enough for me to purchase. There was a BattleBlock Theater 2v2 arena tournament outside as well. They projected the game on the wall of the building, which was funny because I watched them paint the wall just an hour before the tournament started. gem was nervous about joining the tournament, but it was free, so I didn’t see a reason not to join. No, we had never played the arena mode, but so what? 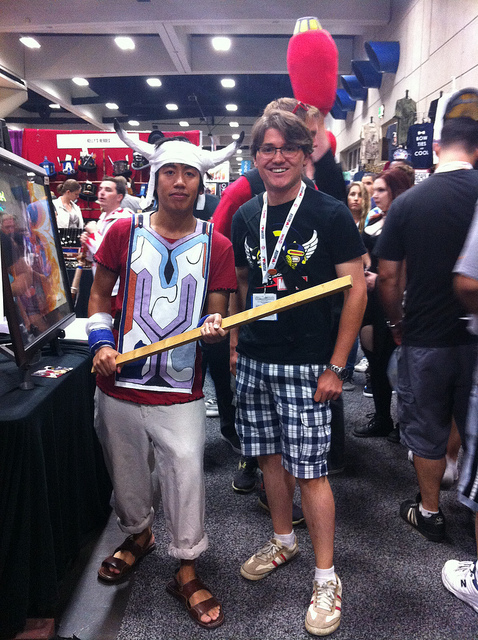 Some Behemoth staff were at the event as well. Unfortunately, I don’t remember their names, but this included the person who does social PR as well as the woman who creates their plushies. I didn’t talk to her, but that seems like such a fascinating job. It’s especially cool because their plushies are all so cute! The tournament was Ball Game, which is a game in which there’s a basket on each side of the level. There’s one ball, and teams try to get the ball into the opposite basket. Once a basket is made, the ball despawns and a new ball spawns. It was a lot of fun, but we lost. Two guys standing to the side congratulated the team that beat us, saying “good job.” As we walked by them, they mumbled, “bad job.” gem hit one of them. He quickly said it was the other guy, and the other guy began to cower, quickly saying, “don’t hit me!” gem replied, “don’t be mean!” Bam! She slapped him, and we left. It was fun. San Diego Comic-Con was this past weekend, and there were plenty of gaming-related things there to discuss. I played some games, took pics with some game cosplayers, saw some interesting booths, and of course took some great photos. I saw things related to Battleblock Theater, Castle Crashers, Alien Hominid, Plants vs. Zombies 2, Pikmin 3, Super Luigi U, The Wonderful 101, The Legend of Zelda: Wind Waker HD, Phoenix Wright Ace Attorney Dual Destinies, Super Mario 3D World, Just Dance 2014, Ico, Adventure Time, and probably more that I’m forgetting. They had arcade cabinets of their three games like usual, and they were very cool. Having played all of their games extensively, I didn’t stop to play any. They were using Toshiba TVs, too! Yay! I did, however, stop to take a photo with this cat guard statue. He was guarding the booth obviously. 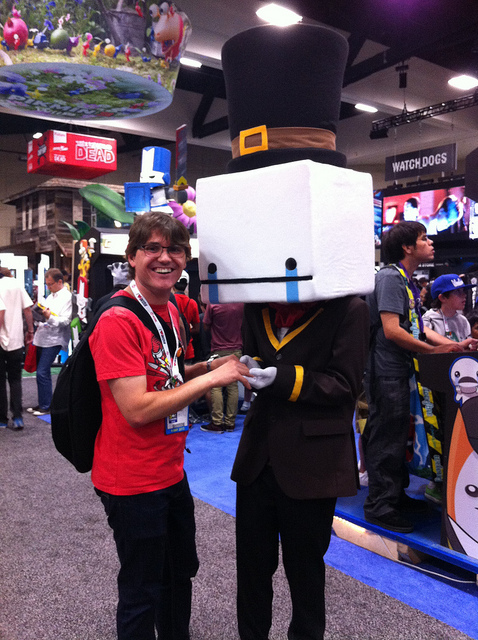 I also took this photo with Hatty. He put his hands out, and I’m not sure what he intended. I just held hands with him. Next to the Behemoth booth was a booth for Plants vs. Zombies 2. I’m still optimistic about the game, but honestly, Plants vs. Zombies Adventures on Facebook has downgraded my enthusiasm to “cautiously optimistic.” The Facebook game totally butchered such a great experience. However, Plants vs. Zombies Garden Warfare looks great too. The booth didn’t make any announcements or have any games to play, but it did have the vinyl toys pictured above. 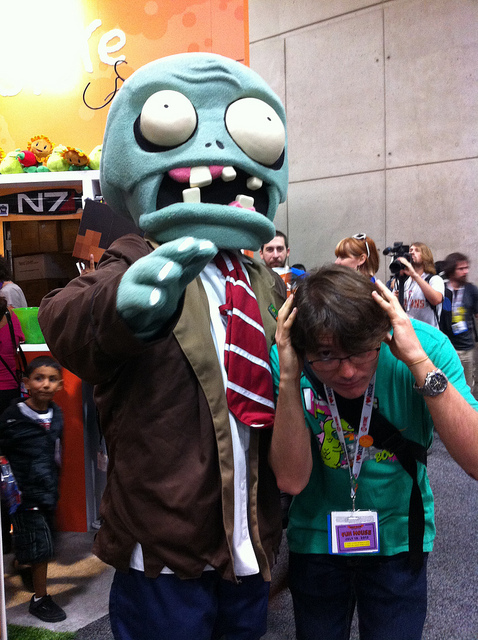 Also, this zombie tried to eat my brains! Ahh! 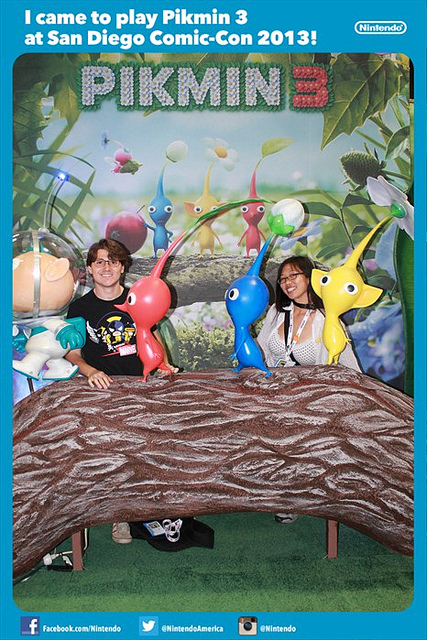 At the Pikmin 3 booth gem and I took this photo. There was also a video playing of Miyamoto discussing Pikmin 3. I’ve never played a Pikmin game, but it did make me mildly interested. I’m probably not going to buy it (because I’m trying to cut back), but I wouldn’t mind trying it. I had seen photos on Instagram of people at other photo-ops, but I couldn’t find them. I asked someone at the Pikmin 3 booth and found out that Nintendo had a large game lounge at a hotel next to the convention center. I headed for it! 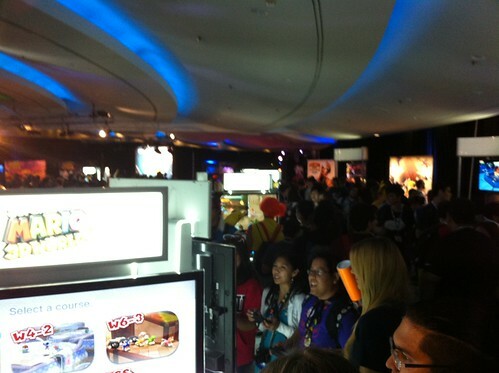 The Nintendo Game Lounge was really awesome. They had a huge variety of fun games, and lots of great decorations and personality. They even made it a bit more like an arcade; after playing each game, the attendant would give you a ticket. You could redeem three tickets for a Pikmin 3 t-shirt. In addition, there were other goodies. 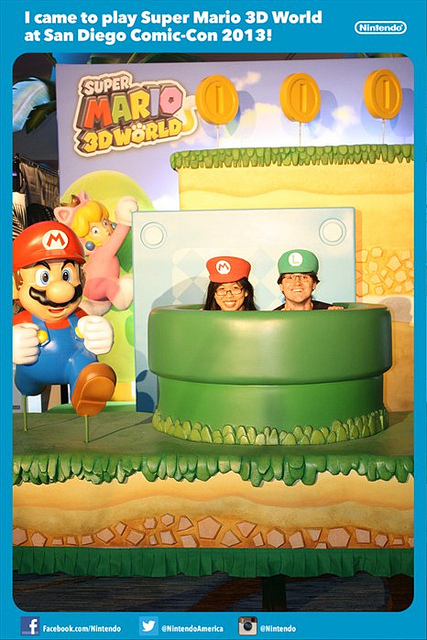 After playing Super Mario 3D World, you could get either a Mario or Luigi hat. Sure, they were just foam, but it was fun. After playing the Wonderful 101 you earned a mask, and there were other things as well that I didn’t try to obtain. 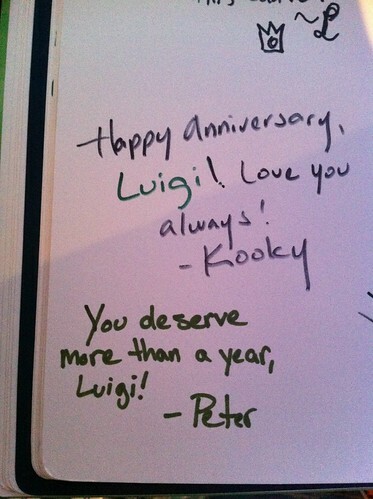 There was a even a large, blank book celebrating the Year of Luigi. 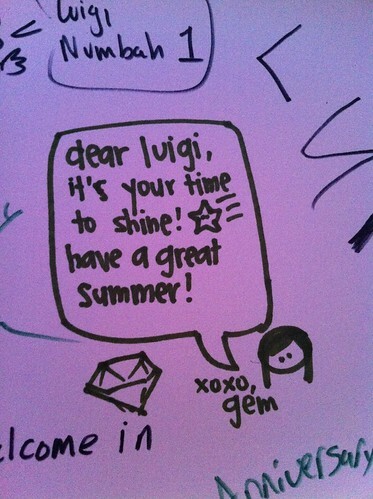 Fans were encouraged to write notes to Luigi in it! 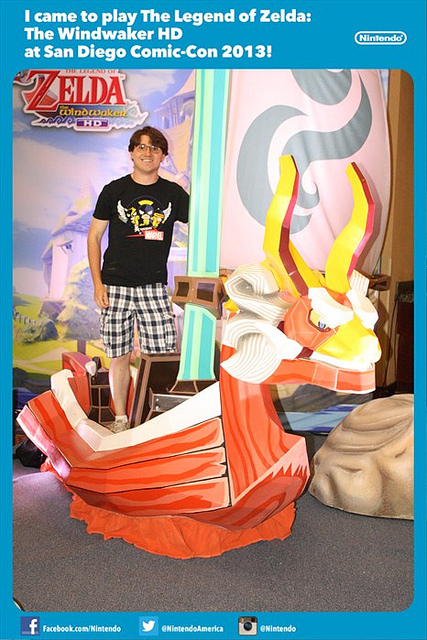 Right outside the lounge was a Legend of Zelda: Wind Waker HD photo-op. Of course, I stopped for a photo. Wind Waker HD will surely look great in HD, and I’m looking forward to it. 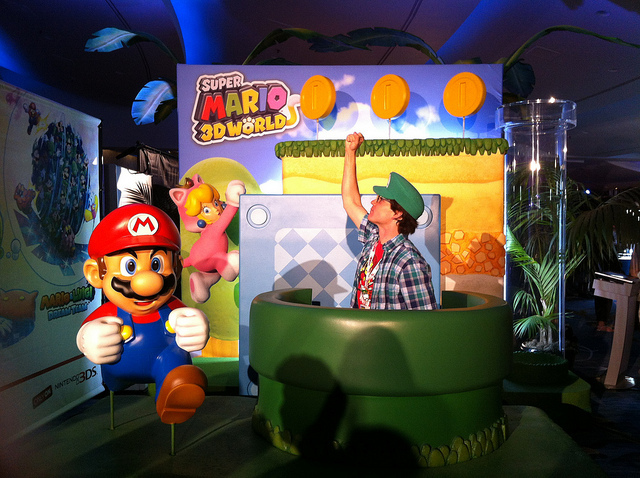 There was a cool Super Mario 3D World photo-op too, and this was the one to which I was most looking forward. It was a lot of fun to take some photos there! I also got to play the game itself quite a bit. We played some four player co-op. I really emjoyed what I played it. We only played some fairly easy levels, and it plays more like the New Super Mario Bros. series than Super Mario 3D Land (unfortunately). It was great for four-player fun; Nintendo really nailed allowing players of differing skill to play together. While I didn’t get any pictures of The Wonderful 101, I did get to play it. I pre-ordered this title a long time ago, and now I’m glad I did. 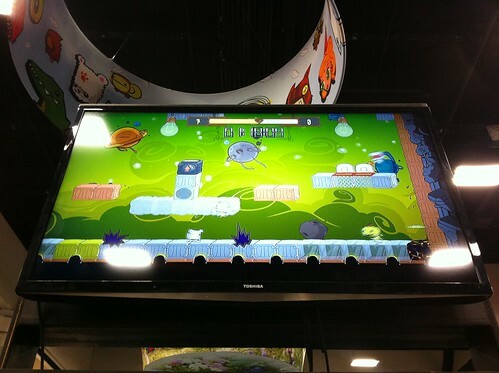 You control a crowd of superheroes while beating up bad guys and solving puzzles. The woman running the game station was very nice and informative as well. I like it when they’re willing to talk a bit like normal, and she was happy to chat with us. She seemed to have a pretty good idea of how the game worked too, which is pretty cool. (They’re from an agency and not Nintendo employees.) On the other hand, she was stuck watching the first five minutes of the game over and over for days while standing in uncomfortable boots. She did mention that only one other person got as far as I did, so that was pretty cool. 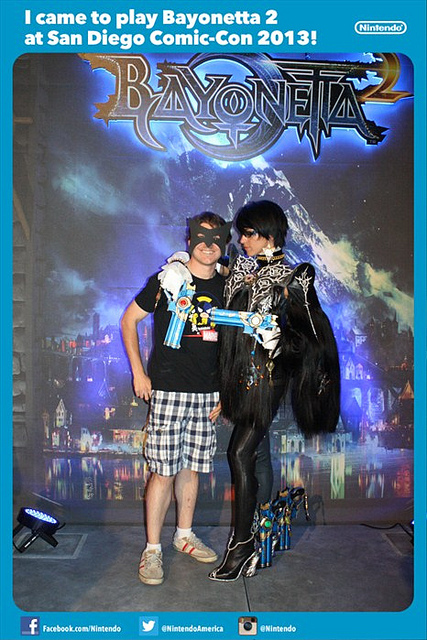 Despite having never played Bayonetta, I stopped for a photo of Bayonetta 2. 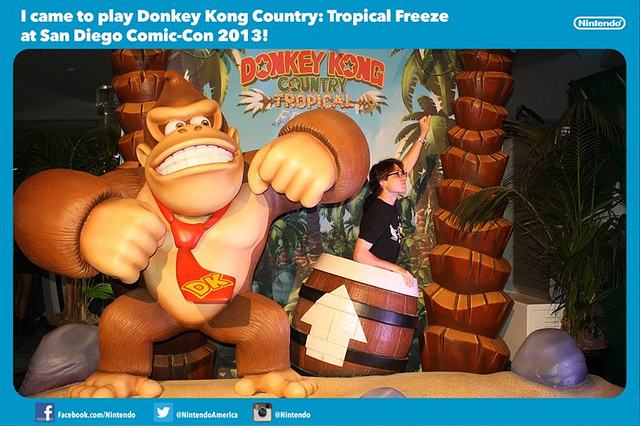 Donkey Kong Country: Tropical Freeze had a pretty great photo-op too. 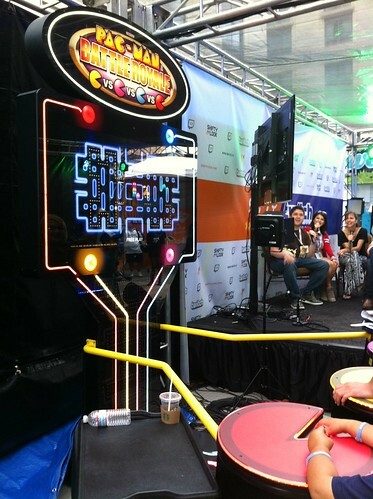 The most fun game I played at SDCC was actually Just Dance 2014. I might look silly while playing, but I’m having a great time, so who cares, right? In this video we’re dancing to the Ghostbusters song! I’m not sure why you can’t hear it, but I’m guessing Antonio was covering the microphone. One dancer was the ghost, Slimer (and that was me), and the other three are Ghostbusters. It was really fun. The dance involved Ghostbusters chasing the ghost, the ghost chasing them, and Slimer even sliming them. I’m definitely going to need to purchase this. 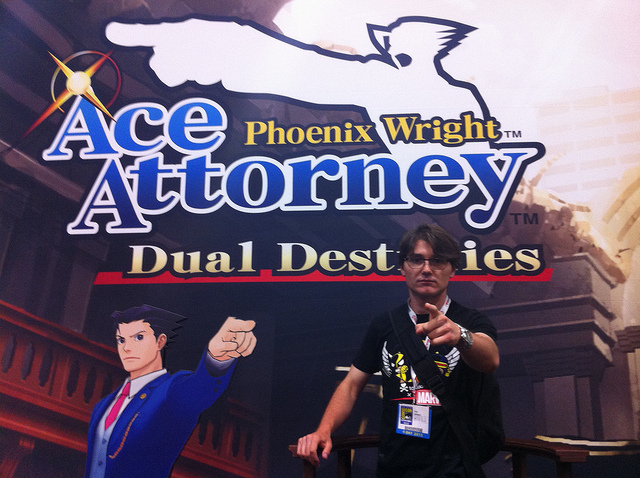 In the Capcom booth, I got to pretend to be Phoenix Wright himself. Take that! Adult Swim had a neat arcade featuring new games, old games, and some in-between. The arcade held a Pac-Man Battle Royale cabinet, which is one of my favorite games of all time. I played some four-player with gem and two strangers. I’m used to playing at a cocktail cabinet, but this one was a standing cabinet. I also played the new Adventure Time game called Adventure Time: Explore the Dungeon Because I Don’t Know! It was pretty fun. It was a four-player dungeon crawler with RPG elements. While it seemed fun, it also seemed boring. Some mindlessness is fun sometimes, and mixed with the Adventure Time humor, I’d expect to like the game more. It suffered from two problems. One, because it wasn’t split screen and didn’t feature any warp mechanics, the party would get split and then the screen couldn’t scroll. Two, the whole game just felt too slow. Maybe the kinks will get worked out before it’s released. 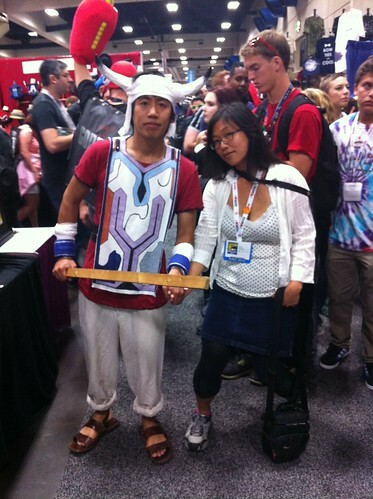 Of course, I can’t forget about this awesome Ico cosplay! I was pretty excited to see him. gem took his hand so he could lead her like he leads Yorda. It was a great idea. 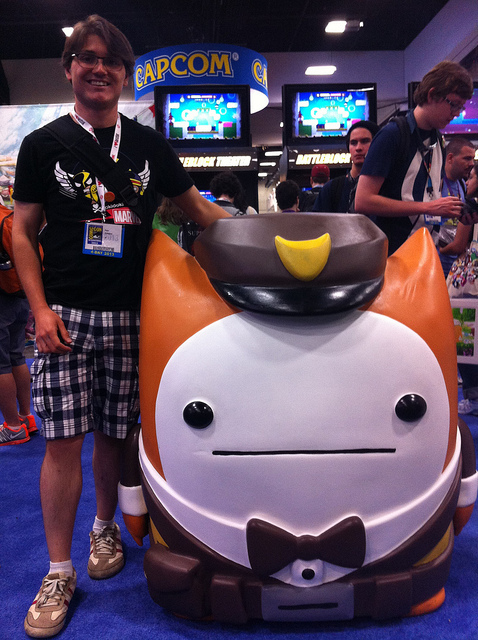 I bet I’m forgetting something, but I think that covers all the major games I played or thought about at SDCC 2013. It was a blast! You can see more photos in my Flickr album if you’re interested. I’ll also be writing another blog post on my personal blog about the non-gaming aspects of the trip. I’ll put a link here after it gets posted.